Ben Franklin must save the world when Isaac Newton unleashes dark magic in this “ambitious” alternate history series by a New York Times–bestselling author (Library Journal). 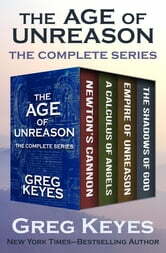 Greg Keyes reimagines the eighteenth-century as an era of apocalyptic sorcery in which a young printer’s apprentice named Benjamin Franklin joins forces with a host of historical personages to prevent humankind’s annihilation by demons and black magic inadvertently released by the great British alchemist, Sir Isaac Newton. Newton’s Cannon: Isaac Newton’s discovery of philosopher’s mercury threatens to destroy all human life on Earth, unless he and his new American protégé, young Benjamin Franklin, can keep the substance out of the malevolent hands of France’s King Louis XIV. “An intricately crafted, elegantly delivered story filled with idealism and betrayal, adventure, and philosophy . . . fascinating” (Library Journal). A Calculus of Angels: A demonic conspiracy has destroyed England while unleashing chaos and terror upon the world. A possessed Peter the Great marches his conquering armies across a devastated Europe. And Newton and Franklin prepare for Armageddon. Empire of Unreason: As eternal winter descends upon Earth, Franklin returns to the American colonies to hone his alchemical skills and ready his secret cabal of scientists, Native Americans, and former slaves for the upcoming battle for humankind’s survival. “The most original fantasy I have read in years” (Kevin K. Anderson, *New York Times–*bestselling author). The Shadows of God: Angels and demons watch and wait as the last warriors of dead Europe invade the New World intent on defeating Ben Franklin’s American alliance and conquering the colonies. “Inventive and exciting, filled with clever details and high adventure” (Science Fiction Chronicle).